Marinate the chicken cubes with the above ingredients by adding a little salt and keep refrigerated. Heat 3 tbsp oil in a pan and fry the chicken cubes in high flame. Stir continuously. Now minimize the flame and fry for few more minutes in a medium flame. Drain the excess oil and keep the fried chicken aside. Heat 2 tbsp butter in a kadaai and when the bubbles start, add chopped garlic and ginger. Saute for few minutes and add the tomato paste. Make the heat medium low and stir well until it gets mixed with the butter mixture. When the color changes to dark red, add the cream and mix well. Now put the fried chicken to this gravy and cook for few minutes until the gravy is get absorbed by the chicken. Garnish with sliced carrot and cabbage. Soak the daal and rice for 4 hours in separate bowls. Then grind them together well along with rice flakes, fenugreek, and cooked rice. Pour into a big bowl and mix well. Put salt and keep overnight( at least 6 hours). 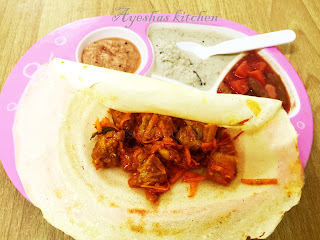 Heat the pan and make thin big dosas and put the tikka masala as the filling. Serve hot with coconut chutney, sambar and red chili chutney.